I get it. Was just surprised by the 7 TVs. I though 7 might be about correct. If you have 4 children aged close together, they never want to share. You end up with 5 in bedrooms, a living room, a family room, and some one might want one in the kitchen. But I did refuse to put one in the garage. Coax going everywhere. It would be nice if my Android app didn’t have to run a sync each day I open it. Have you tried using the Tablo PREVIEW app? It’s available for Android TV and it uses the same back-end communication method as ROKU. 1 - The back-end communication method that Roku uses doesn’t actually support the way Tablo Connect works right now. 2 - Which means it needs to be redesigned and implemented in a brand new way. 3 - And as we work towards that, we want to take the opportunity to make it better, easier, and more impervious to the things that can cause it to fail. 4 - But… there are a thousand other feature requests that we need to weigh against this, that could be enjoyed by a wider population… like commercial skip. If time, money, and engineering resources were infinite, it would have been done a few years ago. But alas, they are not. So for the meantime, we’re stuck with the current paradigm. It looks like Play store won’t allow me to download tablo preview on my phone and tablet. I did try side loading the app a few months ago, and it didn’t seem like it was very touch screen friendly. Maybe I should try again? I would love to try it! That’s for Amazon Fire devices only (can’t say which ones are supported Fire != Fire and all). 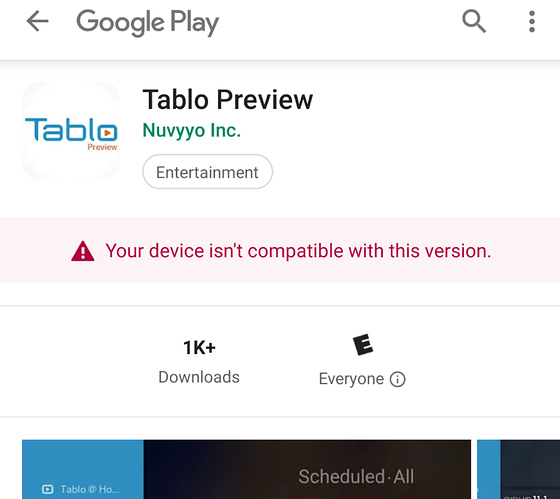 Funny, Google Play Store states my Samsung Tab S (SM-T700) Android tablet is incompatible, too. It’s requirement is Android OS v4.2 and up. Mine is Android OS v6.0.1.